Suppose you want to include habitat as a second subject in a bird photo, but also want to keep your photo simple: what’s the minimum you need to capture? There isn’t a specific answer to that question, but it is something to keep in mind. Composing a photo is often a battle between simplicity and complexity. Too many details can be overwhelming, but oversimplifying can skip details that tell a story. I think this photo brings in habitat as a second subject with a minimum of ornamentation. 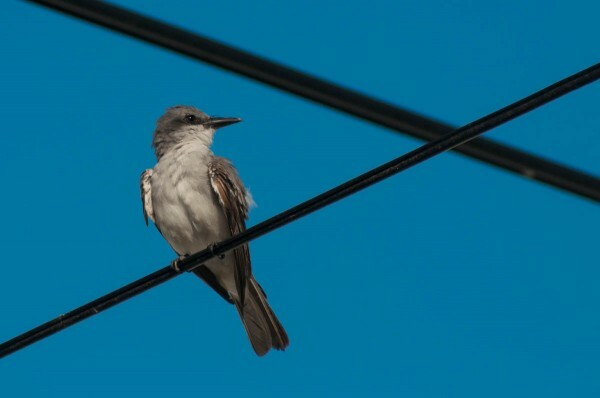 It tells us about the Gray Kingbird’s habit of perching in open spaces where it can spot flying insects to eat, and it tells us how comfortable this species is in urban areas. The crossed lines are a key part of the visual composition, drawing attention to them in a way that a single line doesn’t. I have many photos of birds on a line, and they really don’t seem to be about the line in the same way.